This page is devoted to news/readings/ and more about my latest poetry collection: Not Aloud from MoonPath Press available NOW. Updates will be made periodically. The facebook page is here! If you Like and Share the page it helps to let more people know about the book, and helps MoonPath Press and me. Thanks. BookTree in Kirkland, Wa. and Village Books in Bellingham has the book in stock and available for purchase! You can request the book from any book-seller and they’ll get you a copy. So far I’ve signed and sold over 250 books directly at readings, bookstores and personal appearances (through August, 2018). Every reading so far has been unique with different poems being read and sometimes wonderful surprises, guests and even improvised collaborations combining spoken word and music. The readings will hopefully not just sell some books (which of course is important) but also inspire your inner poet to create something unique. I’m passionate about poetry, not simply as a means to get attention for myself and sell books but to bring people together, to connect with people, to inspire, to heal, to build a sense of community and to show you by example how fun, entertaining, and important poetry can be. Most of the readings are free. If you are at all curious, I hope you’ll make the effort and take the time to experience a reading soon. Thanks Ed Johnson for taking these pictures. 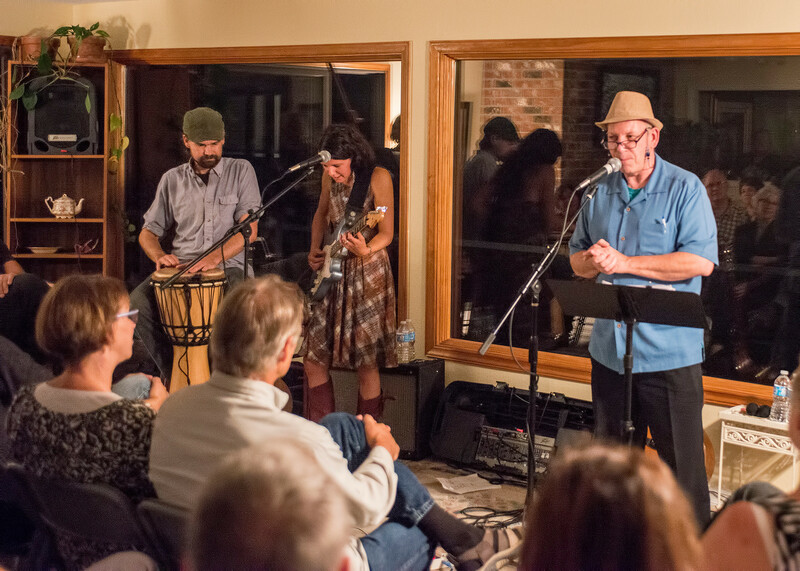 Left I’m doing a little spoken word with music improvisation courtesy of Dave McGraw and Mandy Fer at Pam and Jerry Libstaff’s Words and Music Concert in Vaughn, WA on the Key Peninsula. Below– A picture during the poetry set. All three of my daughters aka ‘The Three T’s ‘ (my brother, his wife and my ex-wife) were in the audience. Over 70 people (standing room only) were part of the sold out program! Thanks to everyone for making it such a memorable evening! Let me also plug the anthology that I am editing. It’s called BANG! The theme is school and public shootings, guns, and the NRA. It is in the final edit process with a 2019 publishing date TBA. The delay is entirely my fault, personal stuff and then opening and running a bookstore has taken priority and mad it challenging to find the time to edit. Check out other great anthologies here at World Enough Writers. Christopher J. Jarmick’s Not Aloud delivers witty, refreshingly honest, personal, thought provoking poetry. Forget any pre-conceived notions of poetry you may have and get ready to be surprised! Releases September 1, 2015 from MoonPath Press (Kingston, WA). 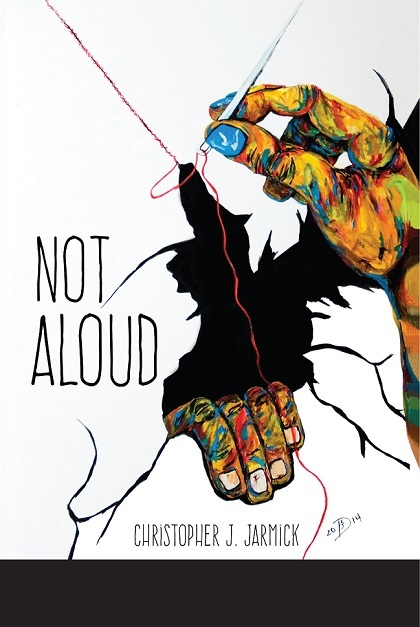 Not Aloud’s unique cover features original art work by Everett artist-poet Duane Kirby Jensen. “I first saw the art in 2014 and knew it had to be the cover of my next book,” said Chris Jarmick. 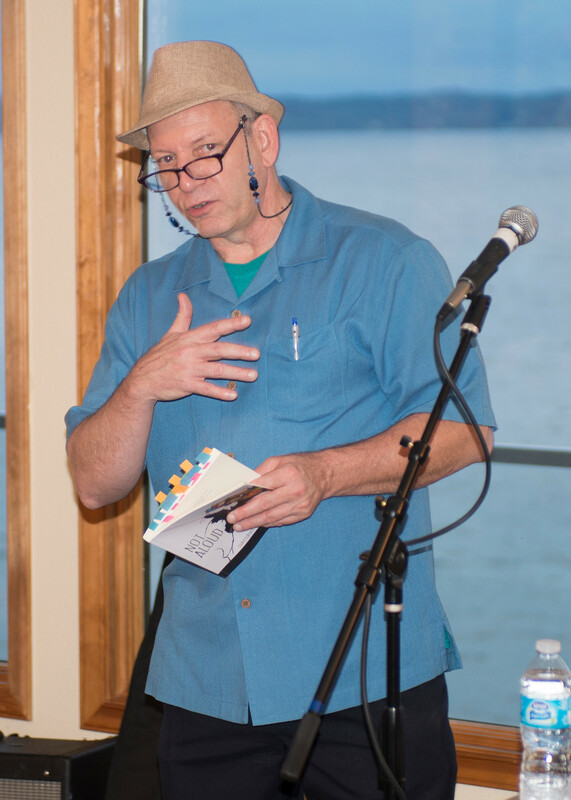 Jarmick is well known throughout Western Washington as a tireless organizer and host of poetry readings, events, and festivals. Since 2000 he has encouraged scores of up and coming writers and poets and curated poetry readings for Nick Licata’s Wordsworth series before Seattle city council meetings, created a series of readings at Pike Place Market with Seattle’s Park and Recreation, and has, in collaboration, created performances blending acrobatics, dance, music and poetry. He currently has a poem on two Rapid Ride King Country buses AND the Rapid Ride Bus Stop at 3rd and Bell in downtown Seattle features his poem and photograph. Jarmick first published a poem when he was a teen living in Poughkeepsie, New York. Beginning in his 20s, Jarmick living in Los Angeles ghost-wrote several screenplays, then worked on several award winning PBS documentaries before working on programs like Hard Copy and Entertainment Tonight. He moved to Seattle in 1994 writing part-time as he pursued marketing and sales jobs and then became a Financial Advisor for several years. His poetry has been published by newspapers, magazines, literary journals, in anthologies, and on the internet. Jarmick has readings scheduled in Auburn, Bellingham, Burien, Duvall, Everett, Gig Harbor, Kent, Key Peninsula, Kent, Kirkland, Redmond, Seattle and Tacoma. Soon: Eastern Washington, Oregon and California. His blog is called PoetryIsEverything. Email emeraldchris@yahoo.com for comments, reading/workshop inquiries or to find out how to buy an autographed copy of the book! My author profile at Goodreads here.